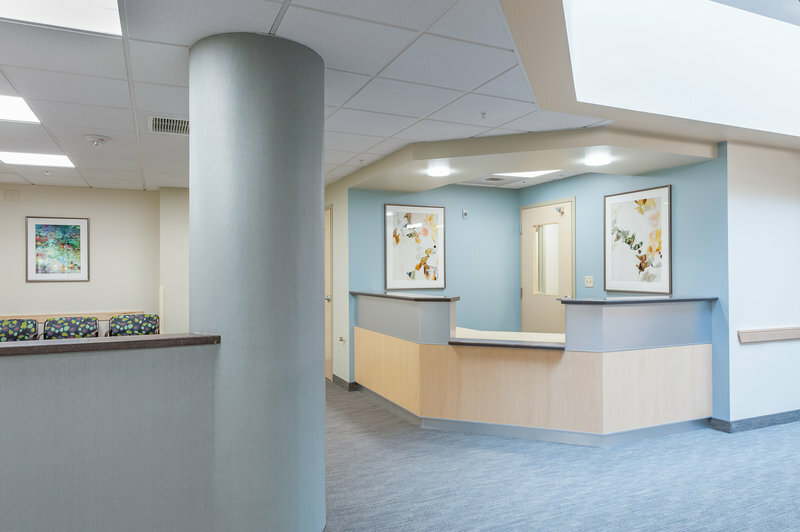 Wise Construction recently completed the renovation of 15,000 SF of OBGYN and Pediatric suites at Harvard Vanguard Medical Associates (HVMA) in Kenmore. A tenant had moved from the 15,000SF allowing HVMA to re-stack, re-purpose and move their OBGYN and Pediatric suites to the new space. Wise completed both the demolition and renovations. The 15,000 SF was unoccupied but all work took place adjacent to occupied ambulatory suites. The pediatric suite was transformed into a waiting area, nurse’s station and 13 exam rooms and offices for the pediatric staff. The OBGYN suite included an 8,000 SF renovation of exam rooms, nurse’s stations and a waiting area. The goal of this project was to transform and integrate the pediatrics onto a primary care floor and OBGYN onto a women’s health floor for improved patient experience. The goal of HVMA’s masterplan is to realign departments to create shorter patient care turnaround times (cycle times) through less travel distance throughout the facility to seek aligned services. That is why both Pediatrics and OBGYN were relocated onto different floors. The departmental project goal is to make pods that include the doctor and their supports along with their exam rooms in a tight knit arrangement that fosters excellent communication. This allows the medical assistant to work at a high level and strip away unneeded work that the doctor is doing, so they get more efficient and feel less rushed. This ultimately has a positive effect on the patient cycle time and a profound positive effect on the patient doctor experience. Where parking is such a high commodity in the Kenmore area shorter and better patient cycle times improves the parking garage space management at the facility garage. The biggest challenge of this project was working within an occupied active healthcare environment. The floor where the Pediatric and OBGYN suites were located was vacant, but the floors above and below were occupied. When working within an occupied working environment activities like material loading, man power and dust control become quite challenging. The Wise team had to work these routine and necessary activities within the constraints of a healthcare environment. Material loading had to be done during off hours so there was as little impact as possible to the workforce and users. The noisy work was completed during designated times throughout the day where noise was permitted. This required close coordination with the end users and drove the flow of work and when work was done.